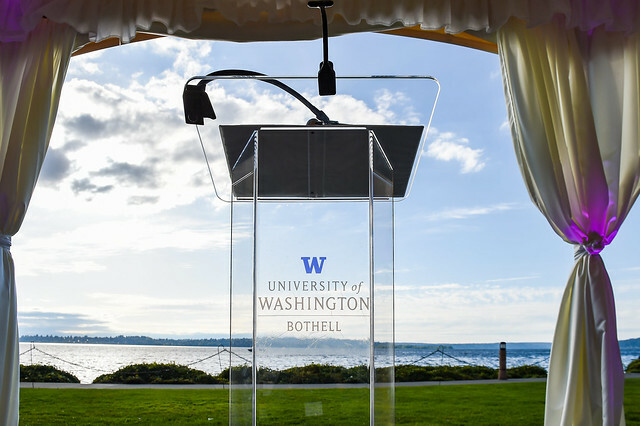 We invite you to join UW Bothell's most generous annual supporters – a dedicated group who believes in the impact that UW Bothell can have in our community, throughout Washington, and across the world. Your participation in the Chancellor's Club opens the doors to access and opportunities for UW Bothell students. Whether you support student scholarships, programs, research projects, special events or excellence funds, your annual contribution makes a difference that will last a lifetime. With an annual investment starting at $2,000, you can become a member of the Chancellor's Club today, and help us create a better world for tomorrow. UW President's Circle members receive benefits such as: invitations to academic programs, lectures and special events inculding the annual Presidents Circle Reception, annual recognition in the Report to Contributors, borrowing privileges at UW Libraries, access to the Waterfront Activities Center and the Golf Driving Range at reduced rates, discounted parking on the Seattle campus, complimentary annual membership in the UW Alumni Association with associated benefits, and credit toward Tyee points for Tyee donors. To learn more about the Chancellor's Club or the President's Circle, contact us at uwbgive@uw.edu. The 2018 Chancellor's Reception, held at the beautiful Woodmark Hotel on Carillon Point, was our chance to thank our dedicated volunteers and donors for their support of UW Bothell. We presented Ralph and Doreen Boy with the 2018 Legacy Award and heard from two fantastic student speakers, Joey Key and Jomardee Perkins. Please enjoy these photos and the featured videos from the event!